Replace four separate accessories-- keyer, keyer memory, audio filter, and audio amplifier-- with one box containing all four and providing for multiple inputs and outputs. I use all four of these accessories, all the time. 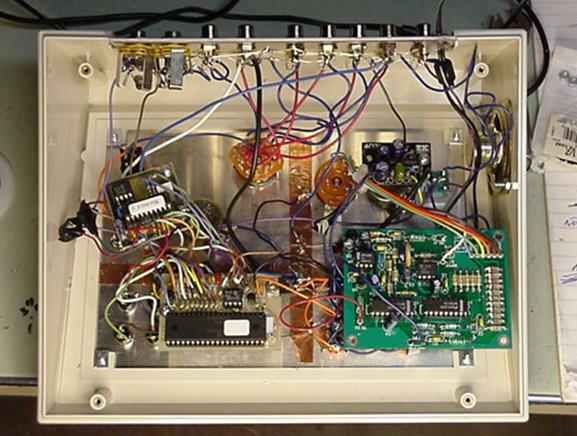 They were built from kits, and each occupied its own enclosure with power supply and input and output connections It was a bit untidy, and to add to the confusion on the operating desk I use a variety of rigs, paddles, and headphones. The keyer is the CMOS III superkeyer from Idiom Press, a full featured keyer with 6 memories which can be banked as 18 messages, speed control via pot, and more features than I will ever use. 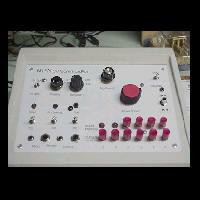 The keyer is enhanced with Island Memory from Jackson Harbor Press. It is an add-on memory system designed for dumb keyers, but has some features that are useful with an advanced keyer like the CMOS III. It adds four additional message memories, and the ability to record message memories "live" while sending. On the audio side, I can switch in an original SCF-1 SCAF Filter from Oak Hills Research, which was discontinued in 1997 when the chips were obsoleted. 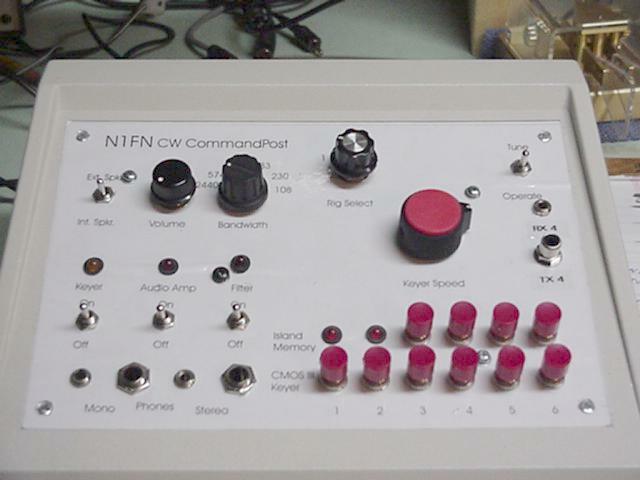 The Vectronics CW filter is an excellent substitute and can be mounted direct to the panel. 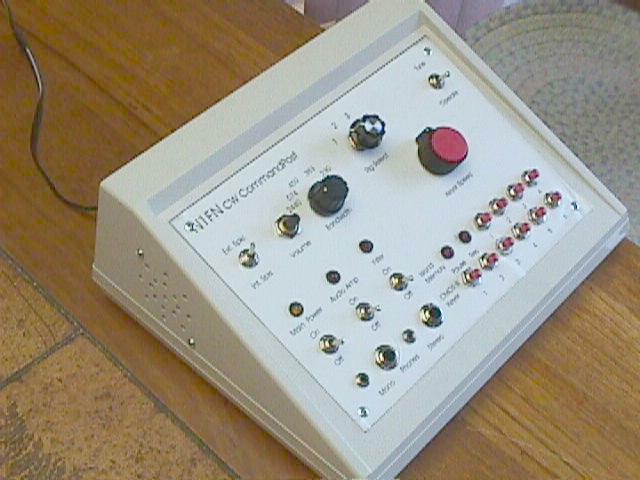 A one-watt audio amplifier from Radio Shack (also no longer available, but see the Rainbow Kit amplifier which is less expensive, better-- and can also be mounted to the panel. 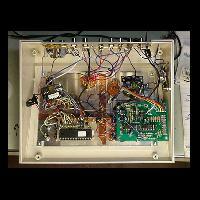 Power supply: everything is powered from a single 12V (nominal) connection. Device Selection: switches provide for turning the SCAF filter and the audio amp on (or bypassing them) individually, with LED indicators. Keyer I/O options: the Command Post has a front panel rotary switch which is used to select the key line of one of FOUR rigs, which can be connected simultaneously on the back panel by either RCA phono jacks or 1/8" phone jacks. Four paddles and two straight keys can be connected (the two marked inputs for paddles offer parallel 1/4" and 1/8" stereo jacks, the key input offers RCA phono and 1/8" jacks). There is also a "tune" switch to key the selected rig, mounted at the upper right corner of the front panel. Audio I/O options: Audio input is via either RCA or 1/8 phone jack, from an audio output (e.g. speaker or phones) jack on each rig. Output is to either stereo or mono 1/4" and 1/8"jacks on the front panel, or a speaker (internal or external, switched on the front panel). There is a volume control for the audio amp which can be switched in or out of line. The stereo headphone jacks are provided for simple connection of stereohead phones (tip and ring are connected on the jack), but will provide for"true" stereo output if and when I get around to playing with some "spatial effect" ideas. The SCAF filter can be switched in and out of line, and a rotary switch determines the selected filter bandwidth. I was somewhat reluctant to show the inside of the Command Post because, frankly, it's a nightmare of point to point wiring and unsupportedcircuit boards. There was an intention to screw each of the boards onto the base of the box (posts are provided) but I found I couldn't get at them when the time came to put the panels with attached electronics into the box. In fact, on the inside at least, this could be the absolute ugliest construction job I've ever done! There were some logistical problems regarding the audio output-- I found I had to choose beteween having all the "other" headphonesjacks, and the external speaker disconnect as soon as one headphone plug is inserted, or leave all the headphone jacks "live" regardless of speaker selection or actual use. I chose the latter course as it could be handy to plug in two sets of headphones. 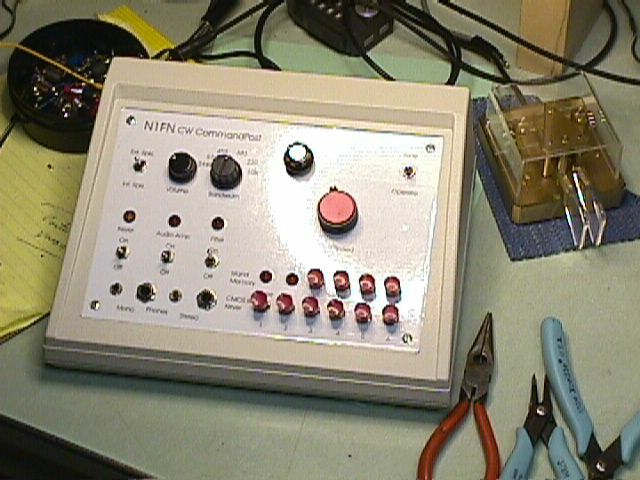 The close-upview on the right is the three DPDT switches that control power to thekeyer, filter, and amp, and switch the audio through the filter and amp. Now that I see the pictures, I should explain the copper strips that are visible. It's copper tape, with conductive adhesive. 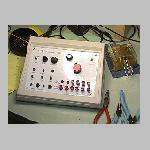 It provides a good ground bus that is much easier to solder to than the aluminum panel. I wasn't particularly happy with the small buttons I had used, and replacing them turned into a major project, including the following modfications"
New panel label-- I wasn't happy with the clear vinyl overlay, and some labels needed to be changed in respect of mods 3, 4, and 5 below. I've written a separate article on how I made the label this time, liberally illustrated. Click here to see it. Replaced speaker switch with a center-off switch-- much easier than wiring the headphone jacks to disconnect the speaker. Rewired the audio path so that filter and amp work independently. 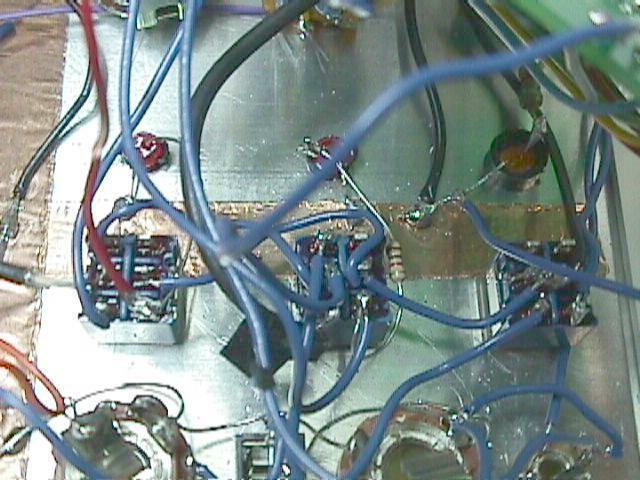 Rewired power so that keyer, amp, and filter are all switchable independently. Replaced the CMOS III chip--original was faulty, with a relative low resistance to ground on one of the pins, and the internal fault was evidently creating the RFI problems. I found it was still a hassle plugging things into the back, especially since I usually wanted to use the CP for audio processing as well as keying. The existing key line (rig) switch had an unused position, so I re-wired the smaller (1.8" phone) jacks to use for four separate audio inputs. That wasn't a complete fix, because I am often testing a rig which I don't want to hook up permanently, so I put parallel keyline and audio input jacks (parallel with "rig 4") on the front of the panel. 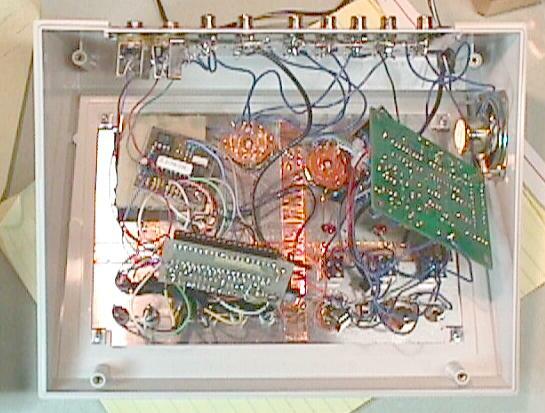 While I was at it I also tidied up the the wiring a bit and mounted each of the four circuit boards on standoffs. The screws for the standoffs are on the front panel, which is not as pretty as it might be, but it was an effective solution. I've reformatted the page and tidied it up a bit, but am happy to say that the Command Post has been in daily use, without maintenance or modification, since August of '99. Meanwhile, I've had to address the "opposite problem." Having set up a showroom for demonstration of various keys, bugs, paddles, and etcerteras, I found a need to drive one "rig" with a variety of keying equipment. So I built a Q&D patch box that I can plug 6 paddles and 6 keys into, with a single connection to the Logikey K5 keyer (which can also be used as a code practice oscillator). I'll try to get some detail up here soon.